Lock & Load: As Earth Nears Total Destruction By Alien Forces, An Elite Space Commander Is Tasked For A Last-Ditch Mission To Save The Planet-And That Commander Is You. Wearing A Cybernetic ally Enhanced Suit Equipped With Human And Alien Technology, You Must Reach The Invaders’ Home Planet And Take Out Their Heavily Guarded Core Reactor To End The War. Fight Off Waves Of Enemies Before A Final Showdown With The Alien Boss. Amplified Reality: Turn Your World Into A Digital Battlefield! Use The Included AR Markers To Take Out Alien Invaders Sneaking Into Your World Through A Portal From Another Dimension Or Accept A Risky Mission To Fight For The Survival Of The Planet. Immersive Controls: Controls Use A First-Person Viewpoint With Pan And Tilt Function. Aim The Pistol And Pull Its Trigger To Shoot Enemies And Targets In The Game. Use Secondary Pistol Buttons To Raise Your Shield, Change Weapons, Select Special Weapons And Reload. Multiple Game Modes: Campaign: Undertake A Dangerous Intergalactic Mission To Save Earth. Training: Hone Your Skills On The Shooting Range. 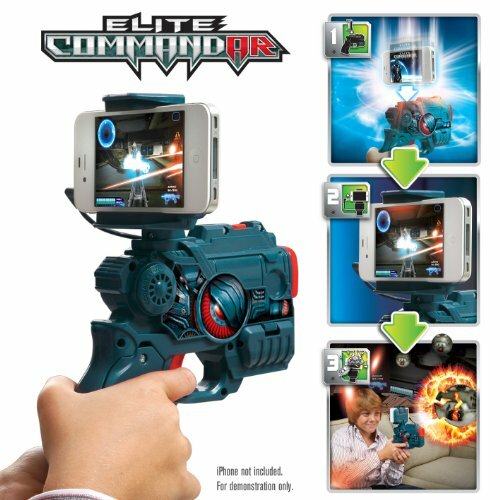 AR Battle: Battle Digital Enemies Invading Your Living Room Or Office. 2-Player Co-Op Action: Need Help Completing The Campaign? Battle With Your Friend In 2-Player Co-Op Mode. Upgrades: Earn Points To Buy Or Upgrade Guns And Special Weapons. Compatibility: Ios And Android Smart Phones With Rear-Facing Camera. Minimum System Requirements: IPhone 4; IPod Touch 4Th Generation. Google Android 2.3.3, 1Ghz Processor, 512Mb, With Back-Facing Camera, Accelerometer, Gyro. Note: Phones Must Support IPhone-Compatible Headphones With Built-In Microphone, Device Width 83Mm Or Smaller. Packaging Contents: 1 Pistol, 1 Detachable Smart Device Holder, 2 AR Markers, And 1 User Manual. As Earth nears total destruction by alien forces, an elite space commander is tasked for a last-ditch mission to save the planet-and that commander is you. Wearing a cybernetic ally enhanced suit equipped with human and alien technology, you must reach the invaders' home planet and take out their heavily guarded core reactor to end the war. Fight off waves of enemies before a final showdown with alien boss. Turn your world into a digital battlefield! Use the included AR markers to take out alien invaders sneaking into your world through a portal from another dimension or accept a risky mission to fight for the survival of the planet. Controls use a first-person viewpoint with pan and tilt function. Aim the pistol and pull its trigger to shoot enemies and targets in the game. Use secondary pistol buttons to raise your shield, change weapons, select special weapons and reload. If you have any questions about this product by WowWee, contact us by completing and submitting the form below. If you are looking for a specif part number, please include it with your message.